Image produced for Cycle Toronto by Jeremy Johnston, TCAT. 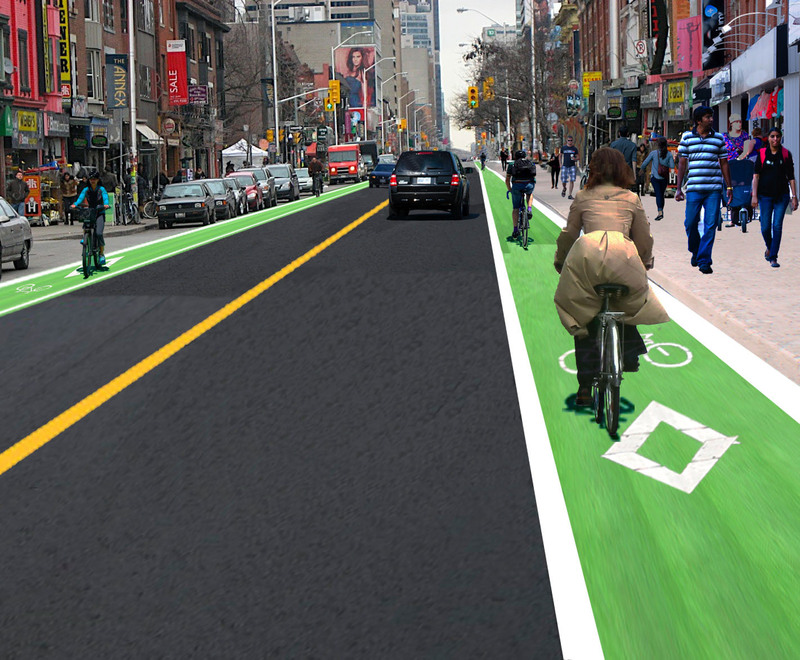 On November 14, Toronto City Council approved the revival of an environmental assessment (EA) for a “bikeway” on Bloor Street. The question is whether this is a cause for celebration or just more of the policies, plans, and promises routinely used to tease cyclists without ever delivering on-road safety. Let’s start by putting the decision in context. The council decision does not mean that the EA will proceed. The EA must first get through the 2014 budget process. The cost of the EA, which has been lumped together with an EA for Dupont, is $450 000. This may be problematic not only because of the dollar amount but because the public is left with the impression that bike lanes are expensive. In truth, the EA is mostly about preserving parking spots -- which the city treats as sacred regardless of the impact on cyclists -- and accommodating motorists. There is actually plenty of free parking on side streets and paid parking in municipal lots over the subway all along Bloor. Even if the EA has budget money allocated, and even if the EA is completed, and even if council then approves a “bikeway” on Bloor, and even if the bikeway itself gets funded, this would still only mean that bike lanes (or sharrows) might be implemented by 2023 (given the proposal is slated for the 2015-2023 capital plan). And there’s another reason why the recent council decision merits caution, or a very quiet celebration along with a lot more work by cycling advocates. Most councillors are entrenched in car culture so when they expend some political capital on a cycling initiative --- however thin its content --- they can then claim to have done their bit for cycling. It’s like saying “I already gave at the office” when another (perhaps more concrete) project comes up. We were actually surprised to find that the Bloor councillors (with one apparent exception) who proposed the EA revival were not even willing to say they supported bike lanes on Bloor! They were only willing to say they support the study. It’s worth remembering that the cycling community has previously celebrated a number of announcements for Bloor-Danforth bike lanes – perhaps explaining the misperception among some people that cycling in Toronto is making significant progress. In reality, we still only have a mere 110 km of bike lanes on a 5,200 km (at minimum) road system. It’s understandable that cyclists end up relishing the crumbs thrown our way in the absence of progress on a serious cycling agenda. While it is important to savour our successes and to recognize councillors who take positive action on cycling we must be careful not to leave the impression that half measures are enough. What’s clear with the recent development on the EA is that any real action on bike lanes on Bloor has (again) been punted past the next election. The timing is all too familiar for cycling advocates. Prior to the 2010 election it was suggested that we should go easy on our demands for Bloor-Danforth lanes in anticipation of the 2010-2014 mayoral term of David Miller when cycling would get a higher priority. So what’s a more immediate step forward on Bloor Street? Pilot projects are routinely used in Toronto and elsewhere to test concepts and to address any community resistance. In early 2013, The Annex Residents Association had actually encouraged Councillor Adam Vaughan to pursue a pilot bike lane project on Bloor from Bathurst to Avenue Rd. Later, Bells on Bloor sent the six Bloor councillors an expanded pilot proposal (BellsonBloor.org) for Bloor between Sherbourne and Shaw. The pilot would encompass five existing or approved north-south bike lanes and include the University of Toronto area. Cycle Toronto collected 1,700 signatures on a petition that included the demand for a pilot. The call for a pilot was simply ignored by the Bloor councillors. The lesson for cyclists is that getting a pat on the back from councillors who are generally sympathetic has virtually the same value as getting a kick in the pants from councillors who oppose cyclists. What matters is delivering on-the-ground safety for cyclists. And even putting aside cynicism about a councillor’s pro-cycling stance, it’s worth noting that a friendly councillor still needs a strong push from cyclists to justify cycling initiatives among his or her anti-cycling constituents. When it comes to Bloor-Danforth bike lanes, there is much more work for cycling advocates before the celebration. Watch the Bells on Bloor video that shows all resident's associations and businesses in support of bike lanes on Bloor. "We are more than willing to lose the parking and put bike lanes on Bloor." Bike Spotting on Bloor: Do you shop by bike? The true pilot is to remove parking; and the real need is for connection west of Ossington where the grid fractures and options are scant. Bloor in the Annex already has Harbord St., – and to buy in to a reworking of Harbord at great cost to a less-safe design and also pushing for Bloor bike lanes is to create another Sherbourne/Jarvis situation that helped get Ford elected. And why not 15m of separation where Ms. Morrison was killed? Your Sherbourne/Jarvis analogy is bang on Hamish. Living west of Shaw, I also agree that a connection west from there is seriously needed, if only to be able to access the existing Harbord lanes.